NI ELVIS III provides collaborative active learning environment for university laboratories and classrooms. 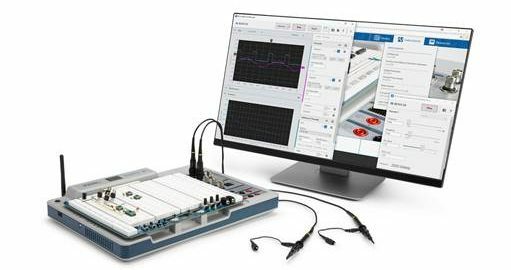 National Instruments (NI) has announced its Educational Laboratory Virtual Instrumentation Suite (NI ELVIS) III, the latest NI system for preparing the next generation of scientists and engineers. NI ELVIS III is a platform designed to meet the specific needs of university engineering education. The system combines instrumentation, embedded FPGA design and web-based access to measurements and curriculum to create a collaborative, active learning environment in the laboratory, studio and flipped classrooms. With application boards designed by leading educators and industrial partners, NI ELVIS III expands the NI ELVIS platform to serve a greater set of course topics across electrical and mechanical engineering. Students can benefit from the easy-to-use, yet advanced, capabilities to work on challenging assignments and gain the necessary skills to design, build and test their projects. Universities today seek to ensure programme accreditation, student engagement and successful student employability. Instructors also require a flexible project-based system for their classrooms and laboratories that supports the rigour of teaching technical skills while also helping students build career-ready skills like collaboration, open-ended problem-solving and teamwork. NI ELVIS III provides instructors with the only platform to address these challenges by incorporating student-centric tools for learning, measuring and designing in a singular and compact industrial-grade system. With WiFi, Ethernet and USB connectivity on the NI ELVIS III, and compatibility with both Mac and PC, students can easily work together and rapidly interact with the instruments and online resources to quickly advance their skills to be industry-ready.